Most damage caused to a hot tubs during the winter is a result of not winterizing the spa properly! I will walk you through winterizing, to prevent costly damage to your investment. 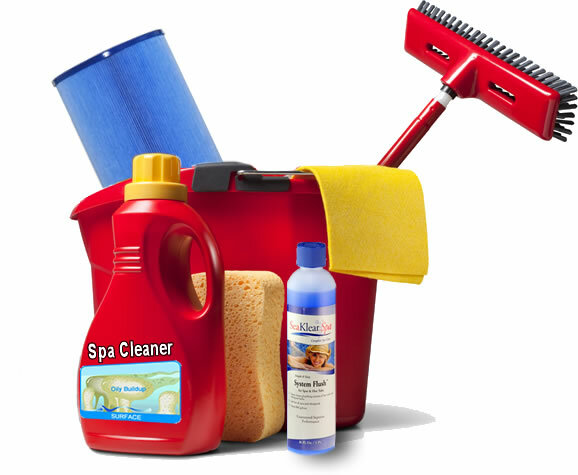 The first step is to run a spa system cleaner through your spa. After the lines are clean, shut the power off to your spa and drain it. Some spas have a drain valve, if not you may need to use a siphon or submersible pump. If you have a blower you will want to purge the water out of it. You can do this by disconnecting the heater and water pumps, turning the power to the spa back on, and running the blower for 15-30 seconds. Once this step is complete, be sure to turn the power to the spa off. The next step is to remove the filter(s). To insure you get them as clean as possible, be sure to use a soak or spray. Let them dry completely prior to storing them in a dry location for the winter. Be sure to remove any remaining water from the filter canister. Clean the filter canister or compartment. Now, loosen all fittings to allow water to drain. There are two unions on the heater and two on your pump(s). The pump(s) may also have a drain plug you can remove to insure that every last drop of water is gone. It is also good to open the wet end of the pump as damage can occur if water builds up in the pump and freezes. If you have a gas heater this is also a good time to follow the manufacturers winterizing directions. Once that is complete it is important to remove any water left in jet plumbing. This is easily done by using a wet-dry vac. First make sure all jets are in the open position. Have your vac set to the blowing mode; this will force air into the jets. Move around the spa clockwise first. Then repeat counter-clockwise to blow each jet out again. Repeat until all large amounts of water have been removed. Now, clean the shell of your spa with a non-foaming cleaner. Wipe all surfaces and rinse. Remove any access water when complete. If you have wax, apply that now. It will make start up and cleaning the spa a breeze in the spring. Final step is to clean the exterior and the interior of the cover with a silicone free cleaner. Silicone can damage the vinyl and damage the cover. Secure and lock the cover to the spa. Also, verify the cabinet is secure and closed up. If it is not too cold or wet you can apply finish to the cabinet at this time. **We did not suggest using anti-freeze in the spa. The reason for this is it is very difficult to remove the residue in the spring. Remember, one of the best times of year to enjoy your hot tub is during the winter. So, if you aren’t leaving for the season, consider keeping your spa running. This will save you the trouble of winterizing, and help you stay warm during the cold months. Do you have any questions or comments about winterizing or using your spa in the snow? Comment below and let us know! We purchased a hot tub for our summer cottage in Northern Michigan that will not have power or occupants all winter. There will be snow and no one to brush it off. Suggestions? We will drain and winterize the inside but need to know the best way to protect the cover and outside. Thank you for your comment. I would recommend storing your spa cover indoors and placing a piece of thick plywood (or similar strong material) with pads on the underside and a Protecta-Spa Coverall over the entire tub, strapped down to the spa using Hurricane Straps. This would prevent snow from crushing your hot tub cover.